Our Safety Crew (in orange) were so helpful! It was sad there weren’t as many of them this year. The morning of Day 3 started early. We had a lot to do, and had to be out of camp at before 7:30. Before that, we had to pack up all of our things, take down and pack up our pink tents, and eat breakfast. There was only a half hour window between the time they started scanning people out of camp, and when camp would close. 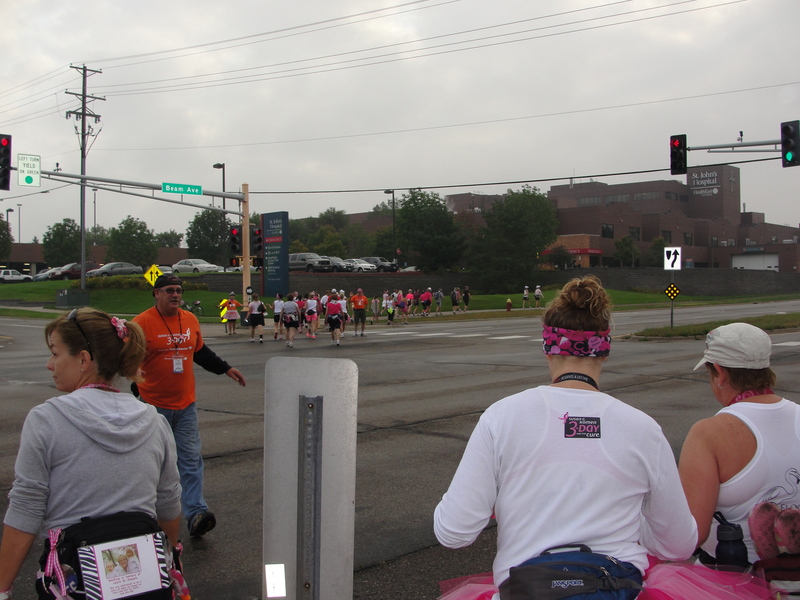 We were all in a big pack walking down Beam Ave in Maplewood at the beginning of Day 3. Finally got to meet another twitter friend, Kim! There were good things and not-so-good things about everyone starting out at about the same time. Pit stop one was very slow. Not the Crew, they were awesome! The lines for the bathroom were atrocious! We tried moving to the lines that seemed the shortest. Twice, the lines stopped moving, and we ended up at the end of the pack. The up sides of standing in line for port-a-potties FOREVER, was meeting up with more friends. I heard a woman say my name, and when I turned around, there was a face I didn’t quite recognize – until she introduced herself as @ilovemyminivan (also known as Kim DeShaw). She was another person I’ve been talking to on twitter for about a year, but had not yet met. We also ran into the entire Mamalitia (Ally’s team). I promised them a picture of their team in honor of Mandie’s mom, a breast cancer warrior. Me and the Mamalitia at Pit Stop 1 on Day 3. Day 3 was a bit hotter, and the feet didn’t want to move quite as fast. We were close to the very last walkers in to lunch. Our feet were tired, and we were moving SLOW, but we were still moving… We kind of had to rush lunch due to being towards the end, but at least we got to eat. We were a bit lucky in that they ran out of the Panera lunches, so they had ordered some Subway for the last few walkers. They didn’t have any meat ones, but the veggie one was surprisingly good! After lunch, we managed to find some new energy, and started making progress again. I really appreciated the Youth Corps and all the other people out cheering for us, especially towards the end of the day! I was exhausted. The motivation they provided was needed. At the point when you are approaching 50+ miles walked in the past 3 days, it becomes a mental game. You have to tell yourself to just keep going. Luckily, at about that point, we could see the Capitol building. The end was literally in sight! 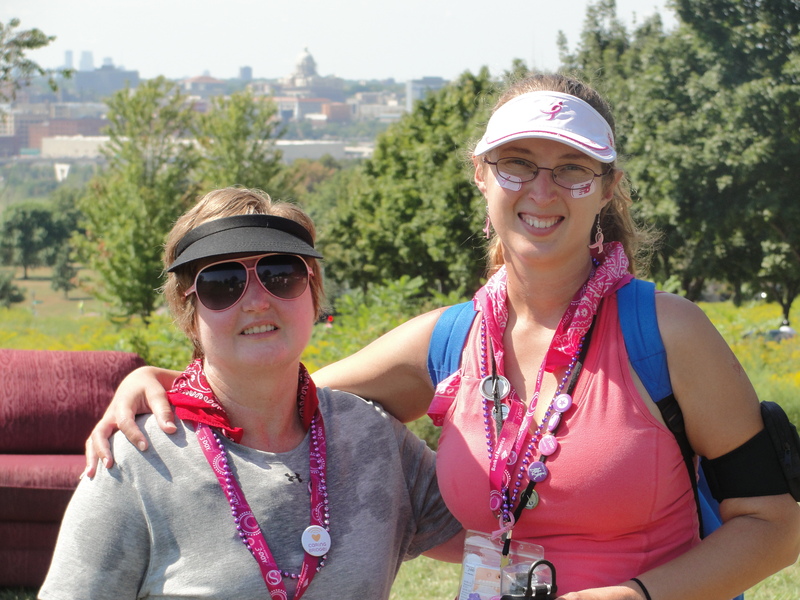 Here’s Kathi and I at Jody’s Couch, the Capitol building is behind us in the distance. Eventually, we made it into St. Paul, and onto the Capitol grounds. Jason’s mom, Janelle, was waiting just as we crossed the finish line. We got our victory t-shirts and roses, then sat down to relax for a little bit before the Closing Ceremony. I was so happy to get my shoes off, and put my flip flops on! I had no new blisters on Day 3! I think that smothering my feet in Vaseline, double layering my socks, and wrapping each of my toes as a precaution was the right combination to keeping my feet in decent shape. The closing ceremonies were amazing. I really can’t even come up with the words that describe it. 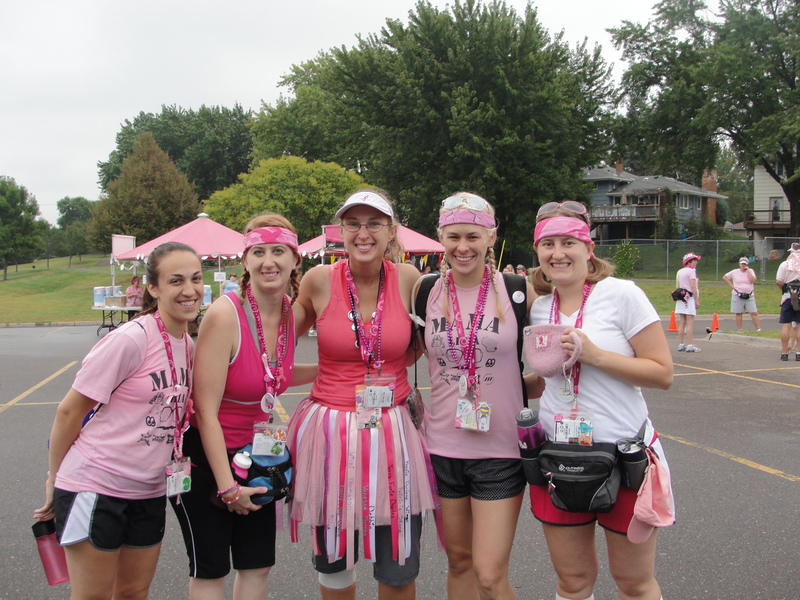 The Twin Cities walkers raised $3.8 million to help fund things such as breast cancer research, emergency financial help for local breast cancer patients, screening and education for underprivileged men and women around the state of MN, etc. 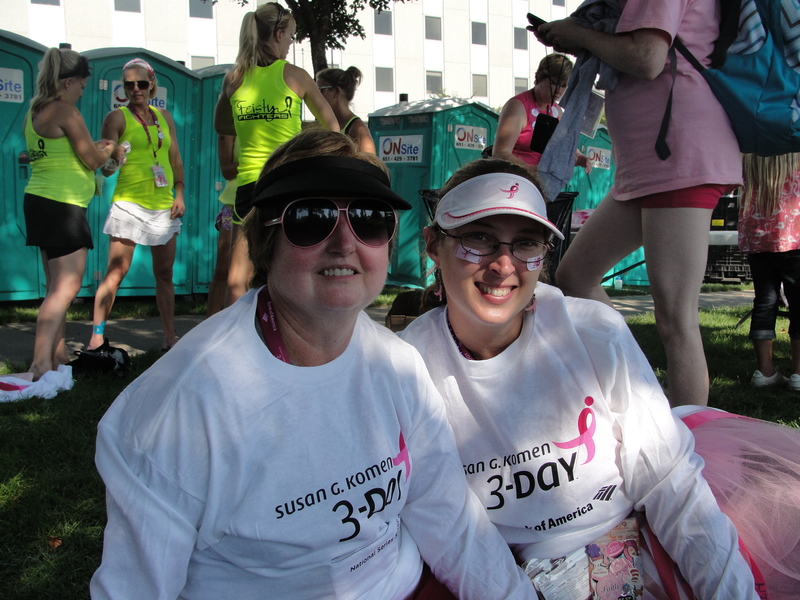 Click here to read where Susan G Komen funds went so far in 2012. 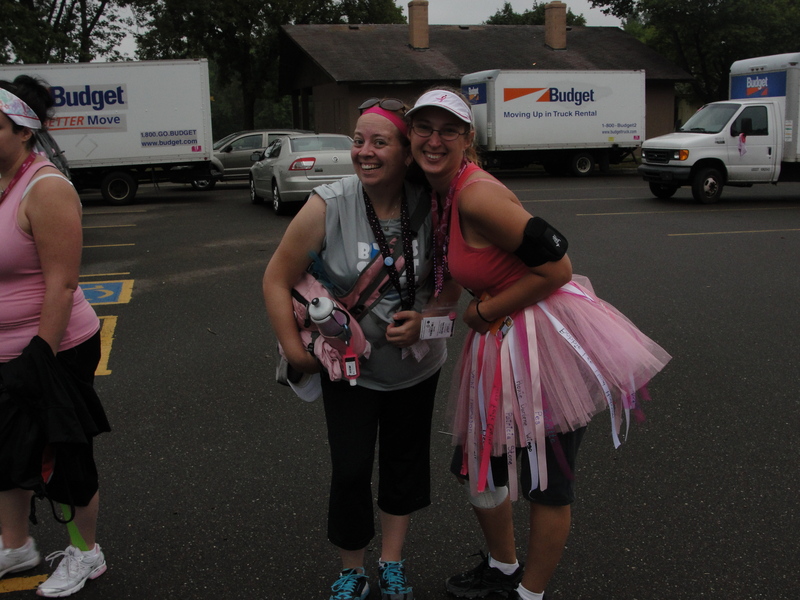 At the end of my 2nd 3 Day for the Cure, I was in much better shape than at the end of last year! I had a total of 6 blisters, all relatively minor. My knee was somewhat achy, but I had my knee brace one, so that helped. I was walking ok, but I was definitely ready to put my feet up! I had done my part to help find a cure for breast cancer for this year. What is one thing that you will carry with you from your experience on the Boston 3-day?There are so many things that the 3-day has allowed me to learn and experience. I learned how to listen, appreciate, understand, and celebrate life. I will never forget the amazing people I’ve had the opportunity to meet; other young adults with stories that bring me to tears by just thinking of them and especially David Bechhofer who created the Youth Corps and has been a role model and mentor to me.